Note: There may be spoilers in the following post, although I have tried to avoid them. I may be a little bit behind the times on this one, but I only recently watched it, thanks to the fantastic free movies feature on YouTube (another great Google innovation). The movie premiered back in 2008, and was officially released in Vietnam in 2009. Passport to Love tells the story of two young Vietnamese men who go from Saigon to Los Angeles to study at an American university. Khang (Binh Minh) is a rich, spoiled, womanizing slacker who stands to inherit his millionaire father's company if he can only manage to get serious, earn a degree, and otherwise change his ways. Hieu (Huy Khanh) is a modest, poor, studious young man who dreams of becoming the next Bill Gates. He is in every way Khang's opposite. He is serious and hard-working, and he is committed in his relationship to the lovely Thao (Tang Bao Quyen). When the two friends arrive in the United States, they quickly fall into their own respective patterns of behavior: Khang takes to partying and womanizing, while Hieu studies hard and talks to his mother and to Thao on Skype every night. Then one day Khang gets arrested for DUI and spends a night in jail, where he meets a beautiful police officer of Vietnamese decent. When she is unimpressed by his charms, Khang commits to earning her respect, which means confronting his character flaws and turning over a new leaf. Meanwhile, Hieu takes a job teaching Vietnamese to an Asian-American pageant queen, Jennifer (Ngoc Diep), the daughter of a family friend. Although Jennifer is more the kind of hard-partying, flighty girl who would appeal to Khang, she and Hieu strike up a romantic relationship. This new relationship starts to interfere with Hieu's dedication to his studies - to say nothing of his dedication to Thao. Will Khang be able to earn the respect and win the heart of the far more serious woman with whom he has fallen in love? Will Hieu choose to stay true to his traditional, hard-working self, or will his heart lead him to a new, less-serious life? While the film's plot seems like a bit of a throwaway, the major strength of Passport to Love is its exploration of a person's moral character and how it impacts our lives. The recurrent theme of the film is the notion that being a serious, faithful, hard-working person will take you positive places in life, whereas being a careless slacker will take you negative places. In contrast to the moral grey zones preferred by North American films, Passport to Love underscores this point again and again, in dozens of different ways, never wavering. It is safe to say, then, that this is the moral of the story. The way it's delivered very much has the flavor of an English novel from the turn of the century: the moral always wins; the immoral always fails. It is message as well as a plot device. The best thing I can say about this movie is what I said to my wife about halfway through the film: "This is like a Hindi movie, only in Vietnamese." To some, that may sound like a derogatory remark, but I meant it positively. As faithful Stationary Waves readers know, I am a fan of the Hindi movie, i.e. Bollywood, genre. When English-language films attempt similar movie concepts - family-friendly, romantic, coming-of-age films with music and dance sequences - it typically comes off extremely hackneyed, owing probably to the fact that the American frame of reference for this sort of thing is Broadway. Broadway, though, is a completely different medium. In Broadway productions, and films inspired by Broadway productions, there is a decidedly New York flavor to it all. The dialogue is coarse, crass, and campy in a way that appeals primarily to the same kind of people who appreciate other aspects of New York culture. It's loud, it's jazzy, and above all, it feels like a play. In contrast, Hindi movies offer similar content on paper, with a completely different cultural reference point. These films started out as films, not as stage productions, and the musical backbone is Indian popular music, not big band swing. So, instead of coming off like something out of a 1940s speakeasy, Hindi films come off more like old fashioned melodramas, complete with character archetypes and expected plot devices such as wedding scenes, dream sequences, and parental wisdom. There is virtually no North American equivalent. 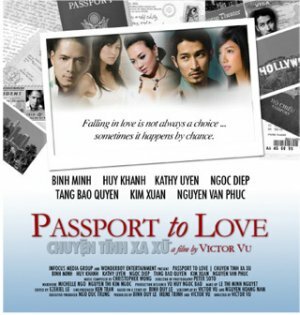 Enter: Passport to Love, a Vietnamese film containing all the elements of a Hindi movie, but in a different language. The film is a romance, a coming-of-age film, and a slice-of-life drama with wedding scenes, dream sequences, parental wisdom, and a light dose of Vietnamese popular music. To someone acclimated to the genre, it is an instantly appealing film, although those with less exposure to such films may find it a little hammy. Are There Busking Rules On The Internet?